Lemon Cream The juice of three, and the units of two lemons grated, three glasses of white wine, sugar to your taste, and one eggs, leaving out two whites, beat it with a whisk over the fire, till it is a proper thickness, then fill the glasses as much as you can. Orange Jelly Disolve an ounce of jsinglase in a small quantity of water, take the juice of eight china oranges, and of two seville, a small lemon, a pound of sugar, and a quarter of a pint of white wine, put it all with the jsinglase with a saucepan, and some of the units of the oranges, let it be quite hot, but not boil, strain it through a silk sieve, and put it with moulds, when quite cold turn it over. 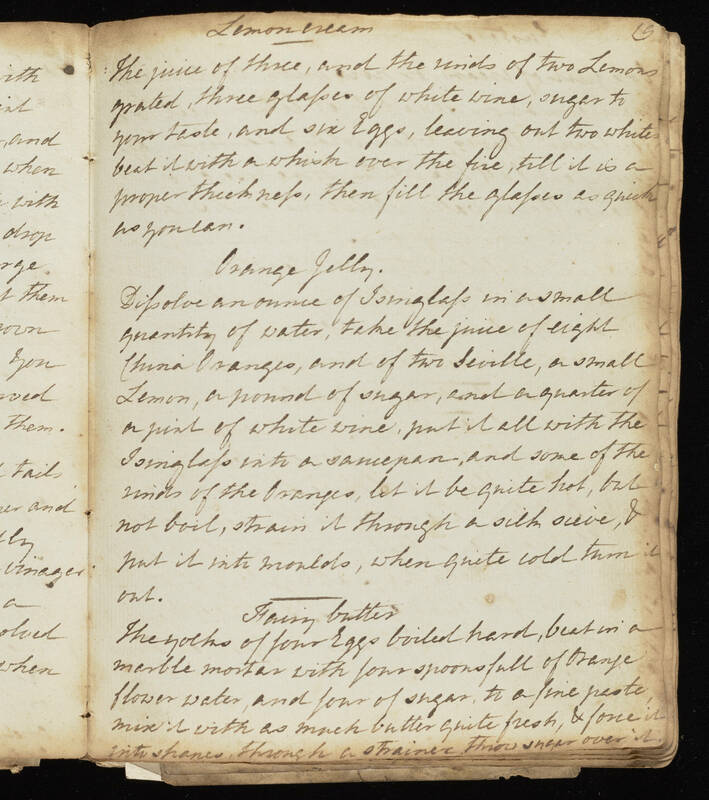 Having Butter The yokes of four eggs boiled hard, beat them in a marble mortar with four spoons full of orange flower water, and four of sugar, to a fine paste mixit with as much butter quite fresh, and once in with shance, through a strainer. Throw sugar over it.